This link below will force you to make a copy so you can put in student info. After it’s copied it will be in your Google Drive. Getting these three pieces of information is easy by following the steps below. 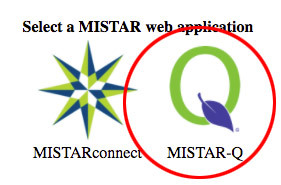 This document is set up to be copied/pasted from MiStar. It’s very simple once you understand how to export the birthday information from MiStar. Knowing this, the only information you truly need is your own login information. 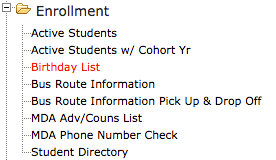 Once you’re logged in, head over to the Enrollment tab > Reports. Once you’ve selected birthday list, change the parameters as shown below. Just change the 1 to a 12 so you have the full-year in range. Above this birthday list, look for the Export Report as shown below. 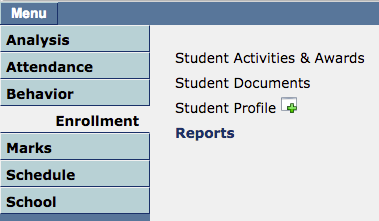 This will export your report into an excel sheet you can use to copy / paste information into our District ID Creator. Copy the student name and birthdate columns to paste this information into our District ID Creator and watch the magic happen. Feel free to print this list off so you’ll have it as a reference!